You don't know this, but the band Incubus was my jam back in the day. I even saw them in concert (front row!) in Fort Wayne, Indiana in 2003 or so. That Brandon Boyd was so attractive and had an incredible voice! Anyway, the polish But My Hands are Busy in the Air is named from the Incubus song Wish You Were Here from the Morning View album. It's an aqua blue crelly base with strong purple shimmer and a slight holo finish. Apparently this is similar to Rescue Beauty Lounge's Aqua Lily, but I never got the chance to buy that one (or any of the dupes that went around). I always wanted Aqua Lily, but I was too poor to buy many RBL back in the day. Anyway, But My Hands applied well, but it was a bit sheer and needed 3 heavier coats for full opacity. Gorgeous! THIS POLISH! Oh man, She Lives on the Borderline is a showstopper. If you want a polish that people can't stop looking at, then get this one. It's named after the song White Unicorn from Wolfmother. Yet another band I loved back in the 2000s. Their first album was their best, in my opinion. She Lives on the Borderline is a multichrome that flashes from red, copper, gold, and green at extreme angles with various sizes of iridescent glitter. I have a few polishes that shift the same colors, but this is such a strong shift and I love the iridescent glitter to make it different. This one is also a bit sheer, but you can always use a base color to add a bit more coverage. 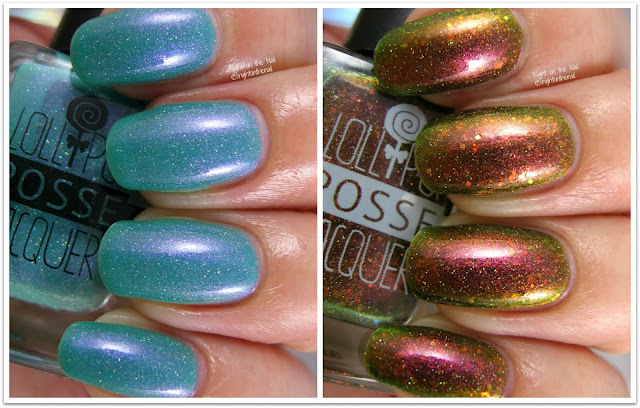 Overall, I am a big fan of Lollipop Posse Lacquer. But My Hands retails for $9.50 while She Loves will set you back $12. You can find more information about Lollipop Posse Lacquer on their website, Instagram, Facebook, and Facebook Fan Group pages.